Express Your Love With Beer! Can you believe it, February is already here! Winter is still staying cozy, but with February comes that holiday that is all about love (Valentines Day, for those who have forgotten, here is our quick inserted reminder! ), and that love translates to beer so well. Whether it is your own love for beer, or get that special beer lover in your life something they will enjoy, Valentines day is a great time to express your love with beer! There are some fabulous Valentines Day Beer Gift Guides out there, such as the one DRAFT put together for the 6 Valentine’s Gifts for Beer Lovers, and there is even a dedicated Valentines Day Beer Gift sets on beergifts.com and other sites, but we are going to break things down for you to give you a list of great Beer Lover Valentine’s Day Gifts and Ideas. 1) First, the easiest, give the gift of beer! – Grab a growler or make your own 6 pack of delicious beer, and give it to your loved one (or yourself!). 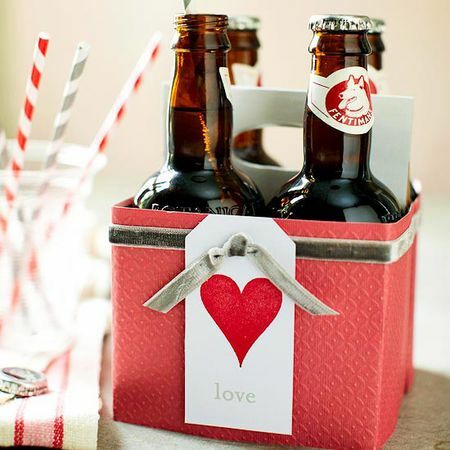 It is easy to decorate with personalized touches and hearts to make it even more special, and maybe your local brewery is even doing a Valentines Day beer. 2) Date Night at a Taproom – Several breweries are having Valentines Day date night specials or events, and if they aren’t, make your own! Head to a taproom on Valentines and make a toast of your love with a pint and food (if they have it, or if not, many taprooms let you bring your own food to enjoy). 3) Chocolate + Beer = Perfection – Chocolate can actually go quite great with certain beers. Search around for chocolate varieties that are known to go well with certain beers, grab them both, and enjoy! Several breweries also have chocolate based beers or the infamous Chocolate Milk stouts, yum! 4) Beer Cooking – Plan a date night in and cook with your favorite beers (and enjoy another pint at dinner, too!). Beer and food are a great combo, and cooking with your special someone will make any Valentines day better. Research online for great beer-centered recipes, and head to your liquor store or taproom to pick up your favorite brew to cook with. 5) Beer-infused Gifts – Nowadays you can buy hop candy, beer soap, and so many things with beer, and all make great gifts for any beer lover. Local stores and many online shops carry a wide-range of yummy or useful beer infused gifts that your valentine will love! No matter how you decide to celebrate Valentines Day, or if you condemn the holiday it all together, beer is a great addition to the mix no matter what! This entry was posted in MBEC Insights and tagged beer, gifts, Valentines Day. Bookmark the permalink.